Manufacturer and Supplier of Electronic, Health Care Products. 2. Eliminate black eye sockets. 6. 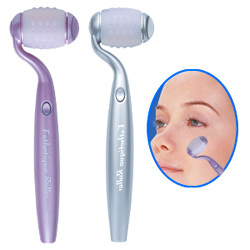 Eliminate dust in the pores, restrain formation of melanin. 7. Burn hypodermal fat, slim the face. 8. Increase skin resistibility to bacteria. 9. 6 massage modes (3 basic modes and 3 combined modes). 10. Automatic 20-minute shut down. 1. Box size(cm): 8.9x4.1x21.4. 2. Carton size(cm): 46.2x43x44.5. 3. Pcs/carton: 100. 4. G.W(Kg): 13.42. 5. N.W(kg): 12.24.